I thought I'd "document" another new development computer build. I will use this new computer to develop CSE HTML Validator v12 and later. Some people might be interested in what hardware CSE HTML Validator is developed on, or just interested in the experiences of putting together your own computer. Therefore I thought I'd share my experiences and some photos. My previous machine that I used to develop CSE HTML Validator was no slouch. It was an overclocked (by changing BCLK (the host frequency) to 166MHz (up from 133MHz) and enabling turbo mode) Intel Core i7 920, EVGA X58 132-BL-E758-TR motherboard, 12GB of Corsair XMS3 DDR3 memory running Windows 7 Ultimate x64 in a Cooler Master 932 case. 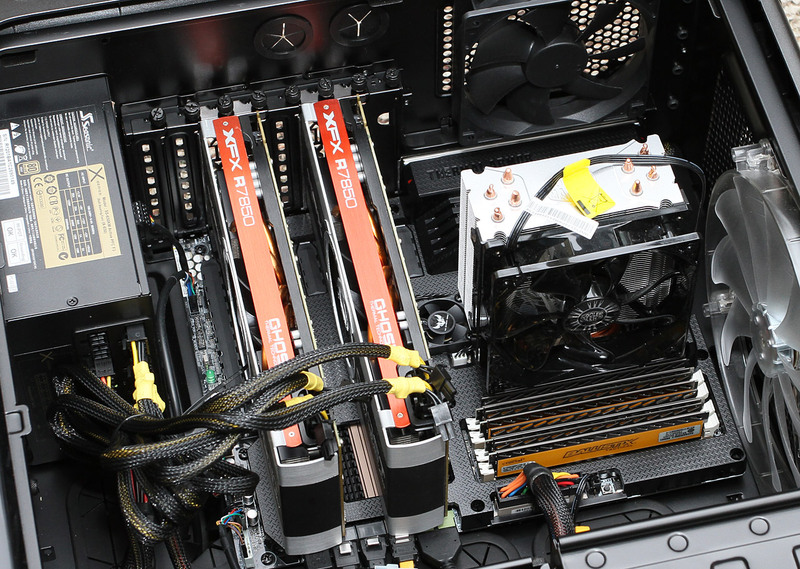 It had dual Sapphire 5770 graphics cards running up to six monitors, two of which were Dell 2560x1600 (one a Dell 3007WFP and the other a Dell 3007WFP-HC) and another two were Dell U2311U's with 1920x1080 resolution. It also had an intel 160GB G2 SSD for the main OS and application drive. I don't mind getting a little extra speed out of a computer as long as it's not a big hassle and the system is stable. I was able to conservatively overclock my previous system and it was extremely stable. I am conservatively overclocking my new system as well. I could probably push my systems faster, but it's not worth the increased risk and heat. I like to stick with conservative overclocks that keep the voltages at stock levels or very close to it. To test the stability of overclocks, I use the torture test mode of a program called Prime95 (available in 32-bit or 64-bit versions) and a program called IntelBurnTest. With Windows 8 coming, the release of new Intel "Ivy Bridge" processors (with PCI-e 3.0), SATA 6 Gbps and USB 3.0, faster SSDs, and improved energy efficiency, I decided it was time for a major upgrade. I managed about 2.5 years of development use out of my last system and I hope to get at least three years of development use out of this machine with maybe an occasional component upgrade here and there. I like to build my own machines because I find it enjoyable. I like picking out the individual components and putting it together. I don't do it because of the cost. It's definitely more expensive for me to build a computer with what I want than to simply buy one off the shelf. Building my own machine lets me research the parts that I want, choosing high quality and high performance components. My philosophy when building a new development computer is to get a "high end" computer but not the "highest end" where you pay a lot more for a little gain in performance. 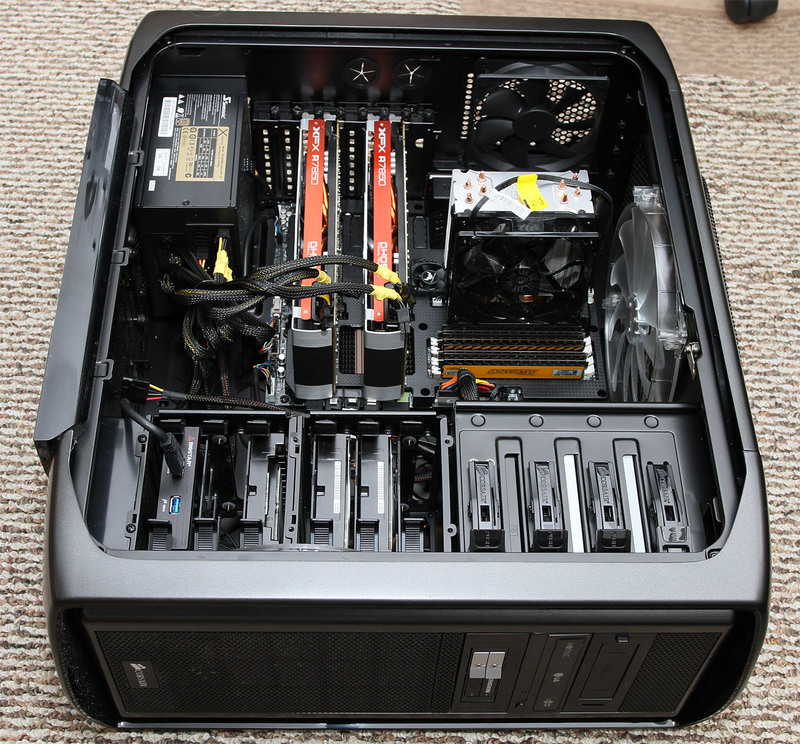 For example, I chose the upper-end Z77 platform instead of the much more expensive X79 platform. I'm sure there are places where the extra cost of a high-end X79 platform makes sense, but I didn't feel that it was justifiable in my case. Building your own machine can also be very time consuming. It takes a lot of time to research to pick out the parts and put the system hardware together. If you're fortunate, it works without any major problems, but I've put together systems before that have had serious issues that took days to figure out. Sometimes you may have to get new parts (after you figure out which part is bad!). After the hardware is put together and working, it can take a long time to get the software right too, depending on what you use. If you are upgrading the OS at the same time, then some applications might not work or you might want to switch to other applications or new versions. Unfortunately, I did encounter an issue that costs me a lot of time (read more below) during this build. For the case, I went with the highly recommended and roomy "Corsair Graphite Series 600T Mid-Tower Gaming Computer Case with Mesh Side Panel CC600TM" (purchased from Newegg). I was pleased with this case. For the power supply, I went with a "SeaSonic X Series X650 Gold ((SS-650KM Active PFC F3)) 650W ATX12V V2.3/EPS 12V V2.91 SLI Ready CrossFire Ready 80 PLUS GOLD Certified Full Modular Active PFC Power Supply" power supply. SeaSonic makes some of the best power supplies and they back this one up with a 5 year warranty. The only downside is that they don't come cheap. For the motherboard, I went with an "ASUS SABERTOOTH Z77 TUF Series Motherboard on Intel Z77 Platform z77 ATX DDR3 1600 Intel - LGA 1155 Motherboard" (purchased from Amazon.com). This motherboard has all the basics, including an Intel NIC. I especially like it for the higher grade components and 5 year warranty. The graphical and mouse-enabled BIOS is the best I've seen, and so are the ASUS software tools, though they could probably use a little polishing up in a few instances where the responsiveness or user interface is lacking. Overall it's pretty slick though, and the thermal radar which shows a lot of temperatures at certain areas on the motherboard is a nice touch. I do wish I had removed the thermal armor, however. There are two small fans to cool the motherboard and which spin at high RPMs. Unless one is in an unusually hot and/or dusty environment, I do not think the thermal armor is worthwhile, but another reason one might like it is because of the looks. For the processor, I chose the high end of the socket 1155 processors - the "Intel Core i7-3770K Quad-Core Processor 3.5 GHz 6 MB Cache LGA 1155 - BX80637I73770K" (purchased from Amazon.com). This new "Ivy Bridge" processor uses a 22nm design and supports PCI-E 3.0 and up to 32GB of memory (though I had an issue with 32GB). This processor overclocks to 4.4 GHz with a +.05 voltage offset. I didn't want to use the stock Intel cooler because I was planning on overclocking and wanted something better. I got the "COOLER MASTER Hyper 212 EVO RR-212E-20PK-R2 Continuous Direct Contact 120mm Sleeve CPU Cooler Compatible with latest Intel 2011/1366/1155 and AMD FM1/AM3+" (purchased from Newegg) and am happy with my decision. This cooler seems quite effective and is not nearly as large as the "Scythe SCMG-2000 Mugen 2 Intel LGA1366 CPU Cooler Fan" cooler I used with my old machine. I also did not want to use water cooling which is more expensive and something I've never done before. Plus, water cooling just doesn't seem worth it compared to an excellenet air cooler. For the RAM, I originally went with 32GB using "G.SKILL Ripjaws X Series 16GB (2 x 8GB) 240-Pin DDR3 SDRAM DDR3 1600 (PC3 12800) Desktop Memory Model F3-1600C9D-16GXM" (purchased from Newegg), however, this RAM caused system instability (which costs me hours of time trying to track down the cause). I do not know if the RAM was bad (it did pass a memory test), if there was something else wrong, or if it was simply incompatible with the motherboard. Switching to 16GB using "G.SKILL Ripjaws X Series 8GB (2 x 4GB) 240-Pin DDR3 SDRAM DDR3 1600 (PC3 12800) Desktop Memory Model F3-12800CL9D-8GBXL" solved the problem. I ended up with 16GB, which is 4GB more than my previous system which had 12GB (6 x 2GB). It would have been nice if the 32GB RAM worked, but for all practical purposes, 16GB should be more than enough for my needs. I returned the RAM that didn't work to Newegg. Shortly thereafter I ran across a good deal on some Crucial Ballistix - "Crucial 8GB (2 x 4GB) 240-Pin DDR3 SDRAM DDR3 1600 (PC3 12800) Desktop Memory Model BLT2KIT4G3D1608DT1TX0" which I purchased from Newegg. It's a bit faster than the G.SKILL (CL8-8-8-24 vs CL9-9-9-24), even though it probably makes little real-world difference. I purchased 16GB of it and am now using that RAM and the G.SKILL is put away for backup and/or future use. Both brands come with lifetime warranties. For the video cards, I am using two "XFX FX-785A-CNFC Radeon HD 7850 Core Edition 2GB 256-bit GDDR5 PCI Express 3.0 x16 HDCP Ready CrossFireX Support Video Card" to run up to 6 monitors (I usually use 5 monitors). Originally these caused significant system instability due to bad drivers, but the 12.6 driver release fixed the crashing problems. There are still driver bugs as of August, 2012, and I hope they get these fixed in the next driver release. For the OS and application drive, I chose the "Intel 330 Series Solid-State Drive 180 GB SATA 6 Gb/s 2.5-Inch - SSDSC2CT180A3K5" (purchased from Amazon.com). Intel makes some of the best SSDs. After going SSD, I would never go back to using a mechanical hard drive for the main OS and application drive. SSDs are simply MUCH faster. There is a night and day difference between a good SSD and a good hard drive so there was no question I was going to get an SSD for this new build as opposed to a hard drive. Even a VelociRaptor (which, by the way, is used in the htmlvalidator.com server) is significantly slower than a good SSD. 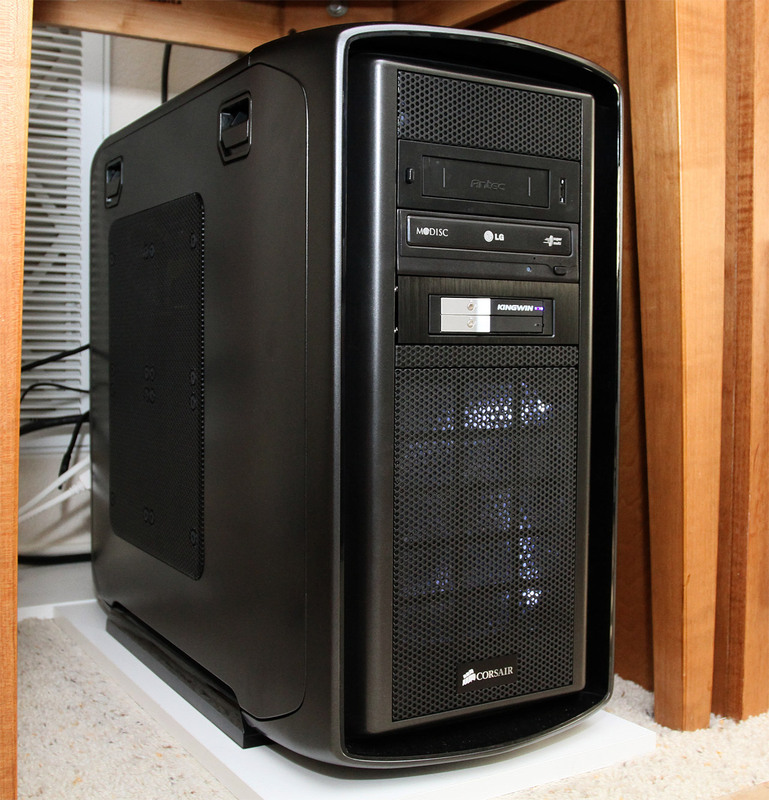 For a "temp drive", I am using a Western Digital Velociraptor with a partition as the "T" drive (for temporary). Because SSD's can wear out and frequent compiling and development of CSE HTML Validator creates lots of temp files and writing to disk, I like to use a real HD for this to take some of the wear off the expensive SSD. I don't think this affects performance much, especially with advanced caching of files, and it's nice to have a "T" drive to only store temporary stuff. For the main storage drive, I use a 1TB Western Digital green drive (model WD10EARS-00Y5B1). This is an older drive I had but saw no good reason to upgrade. For an internal backup drive, I use another 1TB Western Digital green drive (model WD10EADS-00L5B1). The contents of the primary 1TB drive is copied to this 1TB green drive for backup. Just a plain ol' "LG DVD Burner 24X DVD+R 8X DVD+RW 8X DVD+R DL 24X DVD-R 6X DVD-RW 16X DVD-ROM 48X CD-R 32X CD-RW 48X CD-ROM Black SATA Model GH24NS90 - OEM" purchased from Newegg for about $17. I have no need to read or write Blu-ray discs. I'm also using some components I previously had, like a "Das Keyboard Model S Professional Mechanical Keyboard", a Logitech G500 laser mouse, and a "Microsoft LifeCam Cinema 720p HD Webcam for Business - Black". In addition I had some handy eSATA and USB drive docks, including a "Uspeed USB 3.0 / eSATA to SATA Hard Drive Docking Station for 2.5 or 3.5in HDD". I highly recommend drive docks for techies and the Uspeed one (available on Amazon) is the best I've had so far. I'm also using the same monitors as I did with my old system. * Spyder4Elite monitor calibration software - I consider this a "necessity" when using multiple monitors when they are different models. This makes the whites look the same and the colors better. If you don't use color profiles, then the whites on the monitors can be very noticeably different. I was easily able to overclock the Intel 3770K processor to 4.4 GHz by changing the multiplier in the BIOS to 44 and using a +.05 voltage offset. I think this is fairly conservative. I could push for more but there's really not need and I don't want to have to increase the CPU voltage and generate more power usage and heat. I plan to purchase a new SSD (leaning toward the 256GB Samsung 830 series or perhaps an Intel 520) and install Windows 8 on it sometime after it is released to the public. SSD prices have been falling fast. Click on an image to see it original size. These photos were taken with a Canon 7D. Below are the scores for this system (Windows 7 scores go up to 7.9). Below are the scores for this system after upgrading to Windows 8 and a Samsung 830 256GB SSD (Windows 7 scores go up to 9.9). UPDATE 2012-11-26: I have to say that I've been very disappointed with the ATI 7850 cards. I'm fairly certain that the drivers for these cards have been buggy and continue to be bugging causing various problems, even system crashes. I will definitely consider another brand next time. Nvidia drivers seem to be less buggy from what I hear. My old 5770 cards were much more stable and bug-free than what I'm currently experiencing. This is useful on a number of levels, even for those who aren't going to build their own. Very nicely done. When Win8 comes, what might you use for a gesture sensitive screen? MikeGale wrote: When Win8 comes, what might you use for a gesture sensitive screen? I wasn't planning on making much use of the new Windows 8 GUI on my development machine so I wasn't planning on adding anything touch-sensitive. However, I was thinking of eventually updating my notebook to something with a touch sensitive screen or even something like a Windows Surface Pro tablet with a docking station... but we'll see. I think there will be a lot of activity with Windows 8 touchscreen notebooks and tablets later this year. Well the time has come, there is a new development machine in my future - near future. The current system is limping along with missing key-caps (thanks to my dog) and Vista OS. Yes, I think I have milked (nursed) as much out of this system as I can. In fact it is starting to have random (heat) shut downs, so I better replace it before backup won't save me. Wrote my first "hello world" in '63-'64. Sense then imbedded systems, security software, and stuff. Currently maintaining 4 domains with every thing form ho-hum pages to database driven reservations and PayPal donations online. As the resident geek on the non-profit theater board I've been "told" I need to reactivate my audio editing/ mastering skills and add video editing to meet the requirements for some of your granters. For next summer I also want to add mobile apps for the reservation system, with what looks like a blizzard of emulators. As an aside I'm also the treasure and maintain the books on my machine. Albert thanks for your evaluation of SSD. That should help with audio and video editing/review. I have in the distant past used a 2 monitor system for audio editing and SW development, great for debugging, but Albert how do you use five monitors? I don't thank I want to spend the time to build my system, but what suggestions does the group have? Just coming to the realization that I need the system NOW so just starting to look around. In the passed Dell system BIOS were built in a way it was hard to update/add hardware. Have they gotten better? Truth is a desktop and a laptop are both needed. Lou wrote: As an aside I'm also the treasure and maintain the books on my machine. Wow... you've got a lot on your hands there! Lou wrote: Albert thanks for your evaluation of SSD. That should help with audio and video editing/review. I don't do audio/video editing, but I would probably use a fast HD for that in order to keep the wear down on the SSD. Definitely use an SSD for your main OS drive & applications though. I am currently using a Samsung 830 256GB SSD with Windows 8 for my main drive and an HD for storage. A new Samsung 840 Pro SSD is out now or coming soon I think, but I know the 830 is "proven". I'd definitely recommend sticking with Intel or Samsung or other well-respected SSD brand. Lou wrote: ... Albert how do you use five monitors? I don't thank I want to spend the time to build my system, but what suggestions does the group have? I put various windows on different monitors. I keep a lot of things open and try to spread them around. This includes several browser windows open to various web pages, my main development environment/IDE (on my main monitor), perhaps a text editor and Help & Manual (a documentation program) on another monitor, Directory Opus on another, SecureCRT on another (logged into the server). Lou wrote: Just coming to the realization that I need the system NOW so just starting to look around. In the passed Dell system BIOS were built in a way it was hard to update/add hardware. Have they gotten better? As far as I know, I think they are less proprietary now so I'd say it's gotten better, but I haven't bought a Dell tower/desktop recently. I do have a Dell XPS notebook that works nicely but is getting a little old. I may upgrade that to a new Windows 8 notebook in the future, but want to wait for the notebooks with touch screens before upgrading again (probably sometime next year). Albert Wiersch wrote: I don't do audio/video editing, but I would probably use a fast HD for that in order to keep the wear down on the SSD. Definitely use an SSD for your main OS drive & applications though. Albert Wiersch wrote: I put various windows on different monitors. I keep a lot of things open and try to spread them around. This includes several browser windows open to various web pages, my main development environment/IDE (on my main monitor), perhaps a text editor and Help & Manual (a documentation program) on another monitor, Directory Opus on another, SecureCRT on another (logged into the server). Oh yea, documentation. You reminded me that when I get to the end and am cleaning up I do end up with 5 browsers open to get the "look" similar, well reasonable. I do have some work to do. thanks. I have to say that I've been very disappointed with the ATI 7850 cards. I'm fairly certain that the drivers for these cards have been buggy and continue to be bugging causing various problems, even system crashes. I will definitely consider another brand next time. Nvidia drivers seem to be less buggy from what I hear. My old 5770 cards were much more stable and bug-free than what I'm currently experiencing. I can only hope that they will eventually release some stable drivers. This is with Windows 8.